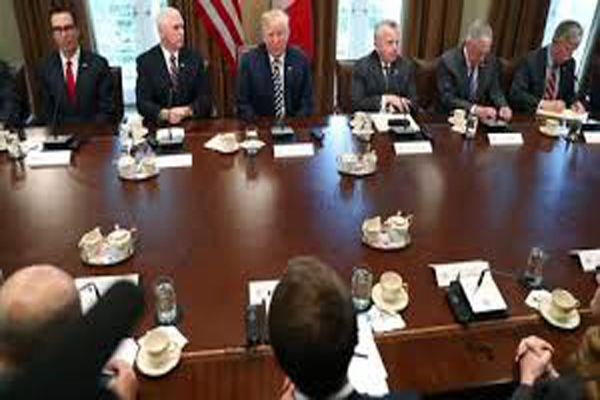 Washington(AP): President Donald Trump’s escalating dispute with China over trade and technology is threatening jobs and profits in working-class communities where his “America First” agenda hit home. The Commerce Department has received more than 2,400 applications from companies seeking waivers from the administration’s tariffs on steel and aluminum imports, which may result in duty payments of millions of dollars for larger businesses. The department has begun posting the requests online for public comment; several of the applications released so far suggest deep misgivings with Trump’s protectionist strategy, especially in areas where he won strong support during the 2016 election. A Steelcase subsidiary, PolyVision, operates a plant in Okmulgee that uses a special type of steel from Japan to manufacture a durable glass-like surface for whiteboards and architectural purposes. PolyVision “cannot and will not be able to procure” from US companies the cold-rolled steel it requires “in a sufficient and reasonably available amount or of a satisfactory quality,” Steelcase said. The waiver request also indicates that a USD 15 million plant expansion may be at risk. Steelcase and PolyVision are on the verge of making the investment, which would create new construction and manufacturing jobs, according to the request. Roger Ballenger, Okmulgee’s city manager, said he and other local officials are “very concerned about the situation with PolyVision.” The tariffs 25 percent on imported steel and 10 percent on imported aluminum are designed to protect and rebuild the U.S. companies that manufacture the metals. The U.S. temporarily exempted several major trading partners, including the European Union, Mexico and Canada. China, which was left on the target list, retaliated by imposing tariffs on USD 3 billion in US products, including apples, pork and ginseng. Trump responded by adding more protectionist measures as punishment for Chinese theft of US intellectual property. And Beijing punched back by proposing tariffs on 50 billion in U.S. products including small aircraft and soybeans a direct threat to rural areas that were key to Trump’s victory. John Hritz, CEO of JSW Steel USA in Baytown, Texas, said his company is in lockstep with Trump’s approach. “We’re in favor of growing the steel industry in this country,” Hritz said. JSW Steel, owned by Indian conglomerate JSW Group, is embarking on a USD 500 million overhaul of the plant that it says will create hundreds of jobs.